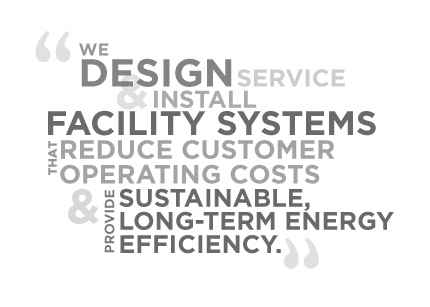 Our team consists of Professional Engineers, Green Building Engineers and Certified Energy Managers. Our team has more than 100 years of experience to help you remain environmentally aware while addressing your facility’s owning and operating needs whether you are building a new, green structure or retrofitting an existing structure to become more energy efficient. We visit your building and conduct an Energy Usage Analysis to identify financial cost-savings solutions. Then, our energy-efficiency experts recommend Energy Conservation Measures (ECMs), such as building automation, lighting control, power monitoring, new HVAC systems, energy-efficient lighting and lighting control motion sensors. Our ECM solutions outline a cost-savings estimate for each measure so we can provide you with a comprehensive payback analysis. After a project is complete, per customer request, we offer an Energy Audit each year to ensure continual cost savings. Are you a good candidate for an energy savings performance contract?